The graph illustrates adidas' revenue from the first half of 2017 to the first half of 2018, by region. In the first half of 2018, the Western European region generated a revenue of about 3 billion euros. 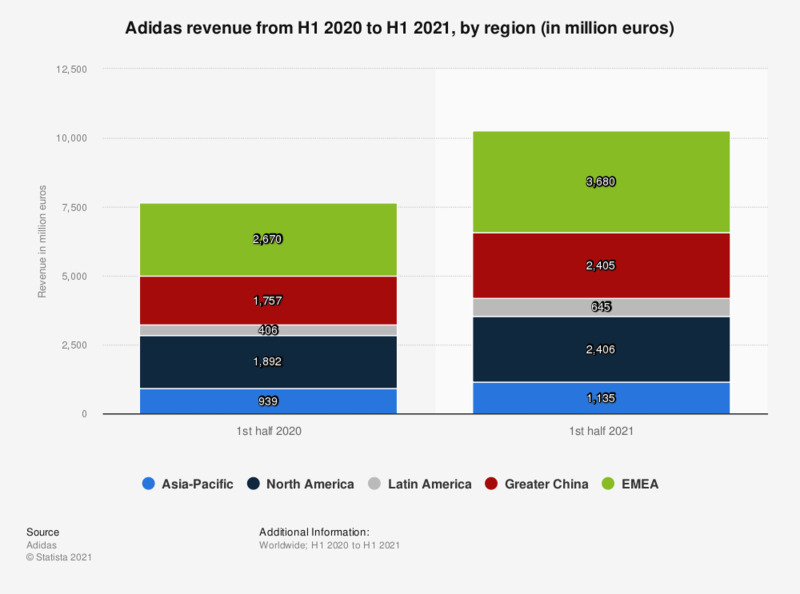 In total, the adidas Group generated a global 1st half revenue of approximately 10.8 billion euros in 2018. From famous athletes to school kids, Adidas wants to help everyone get in the game. The company sells sports shoes, apparel, and equipment; sporting its iconic three-stripe logo in over 150 countries. The second leading athletic apparel, accessories and footwear company (behind NIKE) focuses on football, soccer, basketball, running, training gear, apparel as well as lifestyle goods. The Germany-based company is a brand name to reckon with in the industry. The company's sales by category show the strength of the company across a number of key categories. Adidas is on the move and always has been. It has had an adventurous history since it first grew out of a family business in Herzogenaurach, Germany in the 1920s. With the hostile separation of two brothers’ interests in the 1940s, nearly going bust in the 1980s and then executing two rescue operations, first by sending production offshore to Asia and then by reinventing itself into a design and marketing company. Adidas has ridden the waves of change in the sports goods sector both up and down. Things are now definitely on track and, if the current marketing slogan, “Impossible is Nothing", is anything to go by, the company is brimming with confidence.